Yesterday, November 24th, Israeli soldiers blocked the road at the entrance to Izbat Tabib and entered the village on three separate occasions during the night, firing tear gas canisters and intimidating residents. 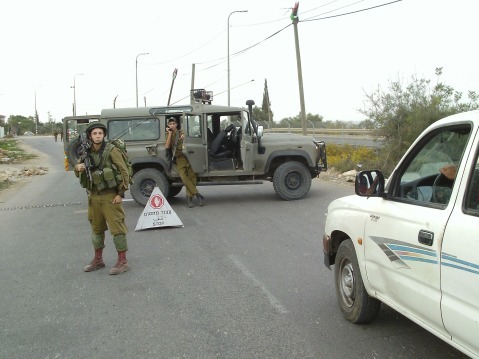 At approximately 14:30, a military jeep carrying four soldiers set up a flying roadblock near the entrance to the village preventing the passage of traffic and pedestrians on the road to Qalqilya. The roadblock remained in place for one and a half hours. Only a few vehicles or pedestrians were permitted to pass according to the arbitrary judgement of the soldiers. Shortly after sunset, an Israeli armoured jeep entered the village. Three soldiers aggressively searched the tent used as a community center, physically searching a 14-year-old Palestinian and threatening to return later in the night. At around 22:00, a foot patrol of four soldiers stationed itself in the bushes near the entrance to Izbat Tabib. On all three occasions, soldiers were confronted by international activists. 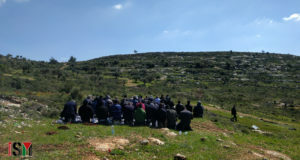 When asked the reason for their presence, they made unfounded allegations that village children had been throwing stones and molotov cocktails onto Highway 55, a road shared by both Israelis settlers and Palestinians. When specific details were asked for to clarify these claims, the Israeli soldiers gave conflicting and inconsistent accounts. For instance, one soldier even claimed that a molotov cocktail had been thrown at 15:00 near the entrance to the village. This was impossible as soldiers had been blocking the road and international activists were present during this time. Finally, at 00:30, soldiers entered the village for the fourth time that day and fired tear gas amongst the houses. Izbat Tabib, population around 250, is located within Area C. Several years ago the village, east of Qalqiliya, was served with demolition orders by the Israeli Army. The orders would mean destruction of 33 houses (73% of the village) and the village school. Two houses have already been demolished, and the school, which has 52 students, is vital to the village and its future. The harassment is part of an ongoing campaign of intimidation and collective punishment to pressurize residents into dropping popular resistance to these demolition orders and to the occupation as a whole.